Vitrum Industries is proud to announce the addition of heat soaking to our extensive range of product offerings. This exclusive process will provide our customers with an increased level of security by reducing site breakage of tempered glass due to Nickel Sulfide Inclusions (NSI). Utilizing the latest in digital recording equipment, Vitrum is able to automatically record the batch data, guaranteeing customers that their glass has achieved the stringent EN 14179–1:2005 (HST) Standard. 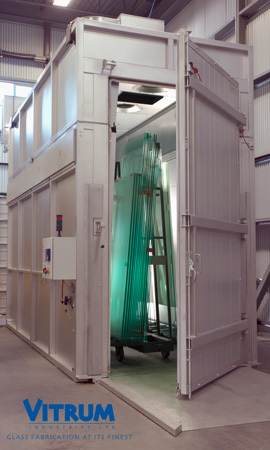 Through our commitment to provide our customers with oversized fabricated glass products, Vitrum has ensured this heat soak oven matches our current oversize capabilities with a maximum size of 118” x 204”. For more information on this product or any of our product offerings contact one of our highly knowledgeable customer service representatives at 604.882.3513 or toll-free at 1.888.391.1166.